Just when we thought it couldn’t get any better… Bam! Another earthquake. Luckily, or not, this one happened as everyone was getting up this morning. I was in the main living area when the doors started shaking like someone was trying to break them down. The iron chandeliers began to swing like a recently vacated trapeze, and the entire room seemed to sway back and forth. I ran outside into the courtyard yelling, “Earthquake! Earthquake!” I certainly did not want the boys to miss out a second time. At the time of impact, one boy was trapped in the shower and the other two were blaming each other for annoyingly shaking the bunk beds. When they finally emerged into the courtyard, they had wide eyes and big smiles on their faces. Well, at least the two who were not trapped in the shower were excited. I was thankful once again that it wasn’t too big and I am still flabbergasted at the power of earthquakes. Turns out, it registered at 6.8 and the epicenter was a mere 53 miles south of us. Not too shabby! On the way to class this morning, there were sections of collapsed brick walls lying intermittently in the middle of a few sidewalks. 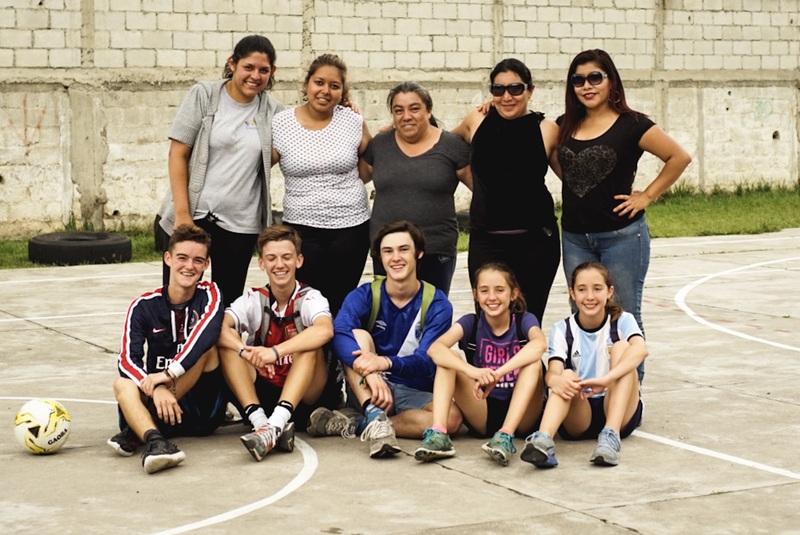 On a safer note, yesterday the kids and their teachers celebrated their last week together with a friendly game of fútbol. I think the idea came from so much smack talking over the past few weeks and it was to be a teacher versus student showdown. 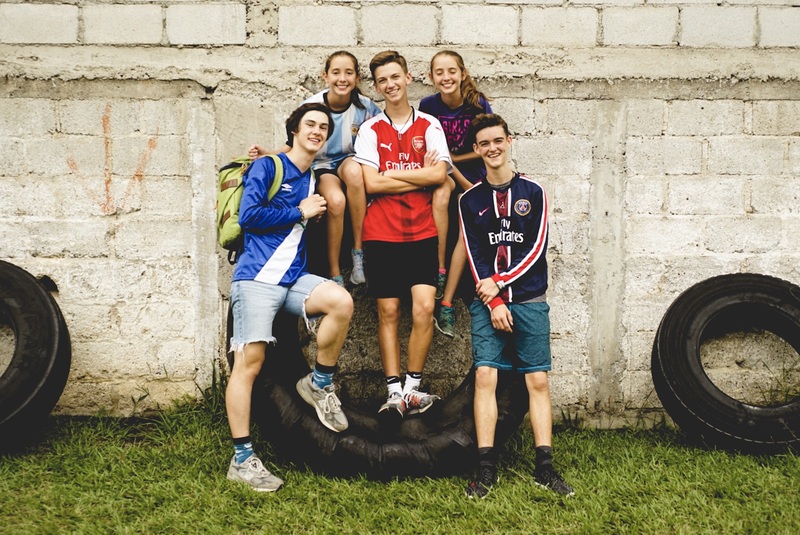 The kids all wore their newly purchased soccer jerseys and prepared themselves for greatness. While a few of the teachers had commendable skills, they ended up having to recruit passersby because they were getting creamed. They all had a super time and it was a great finish to a wonderful experience. 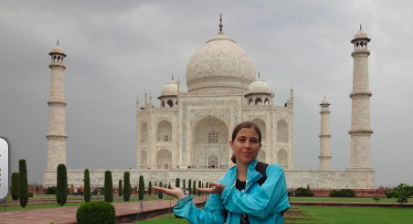 Seriously, I can’t say enough about Antigueña Spanish Academy… one on one instruction for incredibly low prices, and knowledgeable teachers who form relationships with their students and share freely their stories and their culture. I am extremely proud of these kids. They definitely impressed their teachers. Not just with their enthusiasm to learn, but with their great attitudes and openness to whatever came their way. When we first arrived in Antigua, I told the kids, “The typical American stereotype for foreigners is that we are all loud, obnoxious, and arrogant… and it is now your job to prove that stereotype wrong.” I think they took that to heart and did an awesome job doing just that! Bien hecho jovenes! We spent the rest of the day doing last minute shopping and enjoying our final walks around town. Now the time for creative packing begins! While we are all excited to return home to family and friends, we are each sad to leave this amazing country. You know it has been a good trip when you feel like you are leaving “home”. Gracias Guatemala por todo y que vaya con Dios.